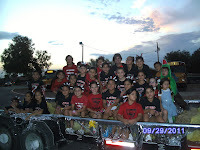 La Union Elementary Viper cheerleaders followed the yellow brick road to the homecoming parade for the Grulla Gators on Thursday, September 29, 2011. The Viper cheerleaders participate in various events throughout the school year in support of their school. Go Vipers!